A glider that is about to take off shall not do so until there is no apparent risk of collision with another glider. When two gliders are approaching head on in clear air, both shall diverge to the right. When approaching head on along a ridge, the glider with its right wing towards the ridge shall have right of way. REMEMBER! GIVE WAY SOONER RATHER THAN LATER! When one glider is overtaking another, the glider being overtaken shall have right of way. A glider engaged in ridge soaring shall overtake by passing between the ridge and the other glider. Other than when ridge soaring, the OVERTAKING glider shall alter course to the RIGHT. 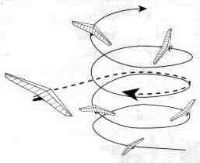 When two gliders are converging at right angles, the glider on the right shall have right of way. When joining a thermal, turn in the same direction as the glider that is already circling. When two gliders are approaching at different heights, the lower has right of way. When two gliders are sharing the same thermal, the lower has the right of way. Pilots above a climbing glider must clear the thermal to let the lower glider with restricted vision climb through. Do not follow another glider closely or remain in its blind spot. At all times maintain a reasonable separation from other gliders according to conditions. Do not pass over, under or cross in front of other gliders unless well clear. Pilots shall maintain separation from other gliders of at least 50 feet horizontally and 50 feet vertically. Avoid abrupt changes in direction and speed when other gliders are present. Fly in such a manner that no other pilot is required to take evasive action. BE AWARE THAT HANG GLIDERS AND PARAGLIDERS FLY AT DIFFERENT SPEEDS, HAVE DIFFERENT FIELDS OF VISION, AS WELL AS DIFFERENT TURNING AND MANEUVERING RATES. IT IS THE RESPONSIBILITY OF ALL PILOTS TO TAKE ANY ACTION NECESSARY TO AVOID A COLLISION. AS ABSOLUTE RIGHT OF WAY!